It’s quiet here in Tucson. This is the time of year that sane people flee the heat if they can. Snowbirds have flown to their summer nests in the cool shady north, college students are on vacation, and local Airstreamers are taking trips up to higher elevations or the California coastline. The result is that Tucson’s traffic (which is never really bad) has declined to Sunday-morning levels most days, there are no lines anywhere, and large-scale outdoor events are rare. When there is something organized, it’s usually at night. I would be one of those Airstreamers on the road somewhere if I had a tow vehicle here. Every year it’s a temptation to find something used & cheap just for this purpose (and many vehicles are capable of pulling the Caravel, so I’d have a wide range of choices), but I never buy anything because I really don’t have a place to store it. So the Caravel sits all summer, a “hangar queen” that consumes resources but rarely works for its keep. With everyone hibernating during the day, I’ve followed suit for the most part and have been seeking evening entertainment. Last week of course there were fireworks all over the city. I took the Stuttgart Taxi up the Catalina Highway, which winds up the Santa Catalina mountain range just north of our home, to get a birds-eye view of the fireworks. It turned out I was not the only person with this idea. Hundreds of people were parked along the roadside to get a glimpse, even though the fireworks were easily ten miles away. The distance meant that this wasn’t the most dramatic vantage point for fireworks, but it was neat to see them popping up like magic colored bubbles over the yellow sodium lights of the streets, and we could watch fireworks from three different venues all at once. 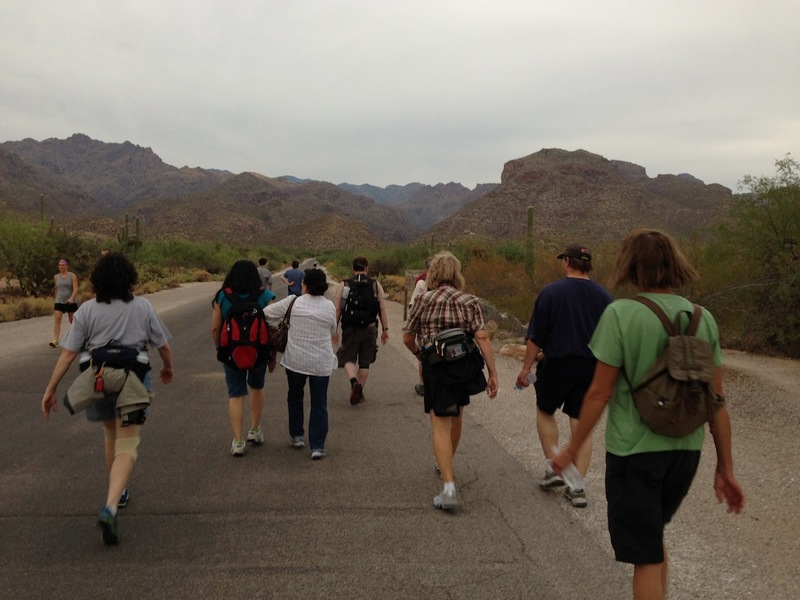 I also encountered a group which walks up Sabino Canyon every Friday night around 6-7 p.m., and joined them for an evening. The walk is up a paved road, about seven miles roundtrip through the canyon and following a perennial stream. Following a thunderstorm last Friday night the air was reasonably cool, but most of the walks this time of year are in the upper 90s or even low 100s even after dark, so you still have to bring water and face some heat. The desert creatures are out too, and the regular hikers report seeing wildlife routinely: lots of birds, bats, rattlesnakes, gila monsters (quite rare), bobcats, and occasionally even a mountain lion. They hike in groups, stay away from the edge of the road in snake season, and carry flashlights. Back at the TBM Cave, I’ve begun a challenge to myself to “take back the Smoothie.” You see, ever since “Rocky” came out and popularized the idea of drinking shakes full of raw egg and sprouts, the classic, decadent, fat-laden, and wonderfully unhealthy smoothie of old has been largely overrun by quasi-health-nuts who feel the only good smoothie is something green with chunks in it or at least the potential to transmit salmonella. OK, to each their own, but I’m just not a fan of calling blended kale and wheatgrass a drink. I mean, you could blend almost anything and call it a smoothie (as Dan Aykroyd aptly demonstrated in 1976 with the Bass-O-Matic), but that doesn’t make it a treat. Oh, I know I’m going to horrify several good friends with this, but we can still be friends. I like smoothies that are cold, thick, delicious, and not pretending to be anything but pure indulgence. 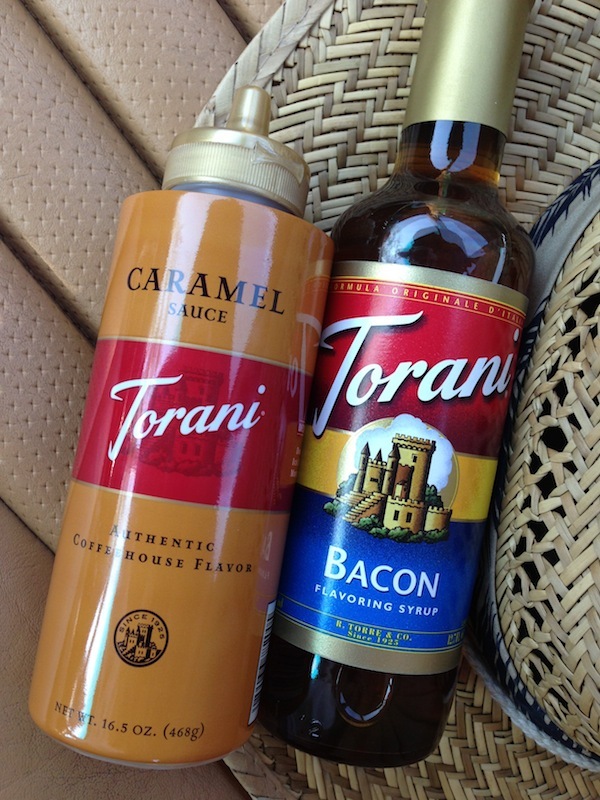 In the interest of finding middle ground I’ll temper my fiendish love of Torani flavored syrups, coffee, chocolate, hazelnut, and even Torani Bacon syrup, by basing all my recipes on plain non-fat yogurt. I’m going wild with experiments in the kitchen this week, working alternately with fruit smooth concoctions (my favorite so far: mango V-8 and raspberry), dessert smoothies (top pick: mocha/caramel), and occasionally a completely whacked mixture. Two nights ago I whipped up a peanut butter & bacon smoothie that was pretty good. Mike came over and refused to even consider trying it. This is the sort of thing that happens when I’m left to my own devices, which I think is good. A little childish play of any type helps reboot the mental processes that lead to creativity. And the results are delicious … mostly. The other exciting news of the day: I received an email telling me that I have won the Microsoft email lottery. My prize is €1,000,000 “and a Toshiba laptop.” I like how they threw the laptop in, as if I wouldn’t be able to afford one of my own after winning a million Euros. It’s the little touches that make me love the spam. Hmm… that makes me think. Spam smoothies?